An FEM approximation for a fourth-order variational inequality of second kind QIAN Fu-bin~1 DING Rui~2 1 School of Management,Suzhou Univ.of Sci.& Tech.,Suzhou 215008,China. 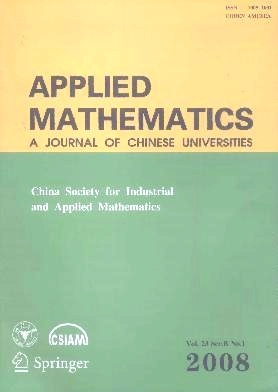 2 School of Math.Sci.,Suzhou Univ.,Suzhou 215006,China.Corresponding author. Some geometrical iteration methods for nonlinear equations LU Xing-jiang~1 QIAN Chun~2 1 Dept.of Math.,Zhejiang Univ.,Hangzhou 310027,China. 2 College of Statist.and Comput.Sci.,Zhejiang Gongshang Univ.,Hangzhou 310018,China. Quadrature-free spline method for two-dimensional Navier-Stokes equation HU Xian-liang HAN Dan-fu Dept.of Math.,Zhejiang Univ.,Hangzhou 310027,China. Some new integral inequalities for conjugate A-harmonic tensors GAO Hong-ya~(1,2)HOU Lan-ru~(3,1) 1 College of Math.and Comput.Sci.,Hebei University,Baoding 071002,China. 2 Mathematics Study Center of Hebei Province,Shijiazhuang 050016,China. 3 Beijing Science Technology and Management College,Beijing 100086,China. Spectrum of a class of fourth order left-definite differential operators GAO Yun-lan~1 SUN Jiong~2 1 Dept.of Math.,Inner Mongolia Univ.of Tech.,Hohhot 010051,China. 2 Dept.of Math.,Inner Mongolia Univ.,Hohhot 010021,China. Global attractor for Hirota equation ZHANG Rui-feng~1 GUO Bo-ling~2 1 Institute of Appl.Math.,College of Math.and Inform.Sci.,Henan Univ.,Kaifeng 475001,China 2 Institute of Appl.Phys.and Comput.Math.,Beijing 100088,China. New construction of special Lagrangian submanifolds in T~*R~n equipped with the standard metric HAN Ying-bo Dept.of Math.,Southeast Univ.,Nanjing 211189,China. Some minimax theorems with strictly monotone transformation TANG Gu-sheng~(1,2)CHENG Cao-zong~2 1 School of Math.and Comput.Sci.,Hunan Univ.of Sci.and Tech.,Xiangtan 411201,China. 2 Dept.of Math.,Beijing Univ.of Tech.,Beijing 100022,China. A separation form of unified convergence theorem LUO Lai-zhen LI Rong-lu Dept.of Math.,Harbin Inst.of Tech.,Harbin 150006,China. L-R smash products for multiplier Hopf algebras ZHAO Li-hui~1 LU Di-ming~2 FANG Xiao-li~1 1 Dept.of Math.,Zhejiang Univ.,Hangzhou 310027,China. 2 Dept.of Math.,NIT,Zhejiang Univ.,Ningbo 315100,China. Twisting theory for weak Hopf algebras CHEN Ju-zhen ZHANG Yan WANG Shuan-hong Dept.of Math.,Southeast Univ.,Nanjing 210096,China. Fuzzy dot ideals and fuzzy dot H-ideals of BCH-algebras PENG Jia-yin Key Laboratory of Numerical Simulation of Sichuan Province,Neijiang 641112,China; Dept.of Math.,Neijiang Teachers College,Neijiang 641112,China. An analysis of single-index model with monotonic link function ZHU Li-ping~1 YANG Xiao-yan~1 YU Zhou~1 LIU Xiang-rong~2 1 School of Finance and Statist.,East China Normal Univ.,Shanghai 200241,China. 2 Dept.of Statist.,Zhejiang Univ.of Finance and Economics,Hangzhou 310018,China. Modified likelihood ratio test for homogeneity in normal mixtures with two samples QIN Yong-song LEI Qing-zhu School of Math.Sci.,Guangxi Normal Univ.,Guilin 541004,China. Vertex partitions of r-edge-colored graphs JIN Ze-min~(1,2)LI Xue-liang~1 1 Center for Combinatorics and LPMC-TJKLC,Nankai University,Tianjin 300071,China. 2 Department of Mathematics,Zhejiang Normal University,Jinhua 321004,China. A locking-free anisotropic nonconforming rectangular finite element approximation for the planar elasticity problem SHI Dong-yang~1 WANG Cai-xia~2 1 Dept.of Math.,Zhengzhou Univ.,Zhengzhou 450052,China. 2 Faculty of Math.and Inform.Sci.,North China Univ.of Water Conservancy and Electric Power,Zhengzhou 450011,China. Lower bounds and modified LPT algorithm for k-partitioning problems with partition matroid constraint WU Biao YAO En-yu Dept.of Math.,Zhejiang Univ.,Hangzhou 310027,China.